Domesticity will be a welcome change for Claire and Jamie during Season 4 of "Outlander," which premieres Sunday on Starz. 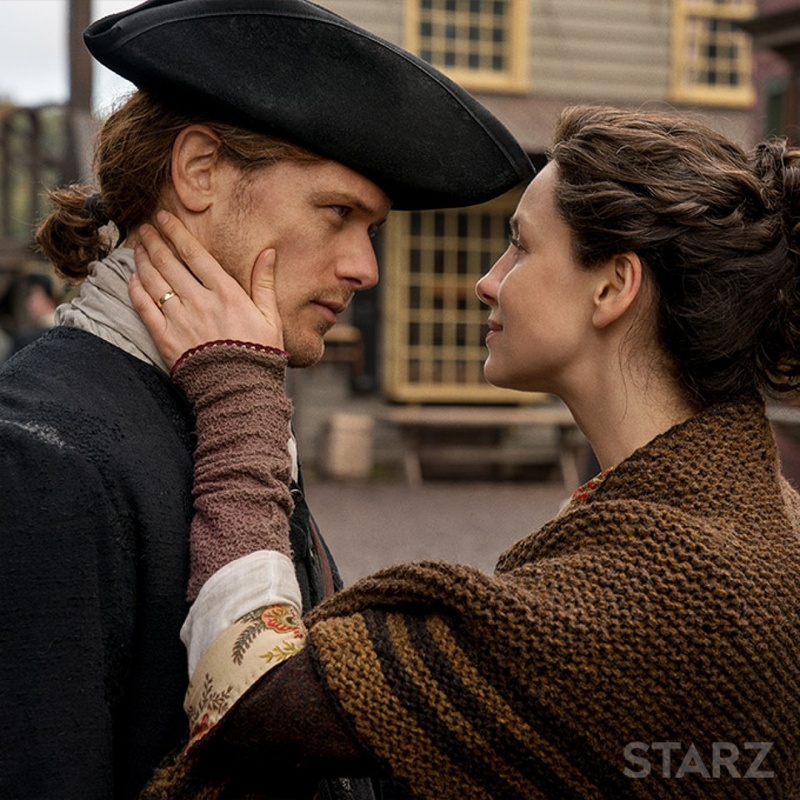 The latest chapter of the sci-fi romance finds the lovers (played by Caitriona Balfe and Sam Heughan) beginning their new lives together in 18th century North Carolina, following a time travel-induced, 20-year separation and death-defying exploits that took them from Scotland to France to Jamaica. "It is a much more settled and content place than we have ever gotten to explore before," Balfe told the crowd at New York Comic Con. "Obviously, it's 'Outlander,' so there's always going to be external forces... but I don't think there are cliffhangers again about whether this couple will stay together or not. That's pretty certain that they're solid." Balfe said at another event at the Paley Center for Media in New York that Claire and Jamie's innate personalities aren't transformed because they are living somewhere new. "We are telling the story of immigrants arriving in a new country and, generally, people, when they arrive somewhere, they retain so much from where they came from. It's that way of bridging that gap of who you were and this new place that you are in," she said. However, Heughan thinks the characters are profoundly impacted because the New World represents freedom and opportunity. "We're constantly dealing with the drama in previous seasons of trying to find each other or trying to find a place to stay and, here, finally, they find that and the land of America seems to be a very positive place for them. There's a lot of danger, obviously, but they are together, at least," Heughan said. Based on Diana Gabaldon's novels, the show begins when Claire -- a British, World War II nurse -- is magically transported to perilous, mid-1700s Scotland where she falls in love with and marries Highland warrior Jamie. Pregnant and fearful that Jamie has died in battle, she returns to her own time and first husband Frank, with whom she spends two decades raising her daughter. When Brianna is grown, Frank announces he wants a divorce, but dies in a car crash before it is finalized. Freed from a loveless marriage and armed with evidence that Jamie survived the war, Claire goes back to the 18th century to find him. Trailers and interviews have hinted that Brianna, played by Sophie Skelton, will eventually follow her mother into the past. While the series attempts to accurately reflect the time in which it is set, incorporating issues such as African-American slavery and violence against women and indigenous peoples, it doesn't filter it through a contemporary prism, producer Ronald D. Moore said. Instead, it concentrates on the characters and how they would react to certain situations. "The show is not a platform to go and make big statements. The show is a story about these people and these characters and different times and different mores," Moore said. "And, so, we try to tell the story in the most truthful way that it is and not to gloss over it and not to romanticize it and not, at the same time, be strident about it and make judgments from the 21st century about it. You're trying to look at it, but the focus of the show is not about the politics of the time." "Outlander" is still being filmed in Scotland, which has posed some challenges for those working behind the scenes. For one thing, most of the buildings from that time period in the United Kingdom are made of stone as opposed to wood like the structures constructed in the colonies during that era. "We had to build a lot more," he said. "Everything had to be redone -- props, set decoration, new costumes, new visual landscapes, a lot more CGI. ... Creatively, you are also bringing a different mythology, a different land, a different style of storytelling. You're dealing with a polyglot group of people that have come to the colonies at this time." Speaking to fans at New York Comic Con, Gabaldon said it was an organic decision to move the story's location across the Atlantic Ocean even though readers and viewers remain fascinated by this romanticized age in Scottish history. "That Scotland is gone. It disappeared after (the Battle of) Culloden. It was not there anymore, so the Scots had to go somewhere and where a lot of them went was the New World," the author explained. "Some of them went up the coast to Prince Edward Island, Nova Scotia. A whole lot of them went up the Cape Fear River and into the mountains there because it looked like home." Gabaldon said once she decided on the new location, she researched the time period there and discovered the War of the Regulation between British soldiers and the colonists was just getting started. "If you stand back a little, you can see this escalating tide of philosophy, enlightenment and violence that leads straight from the Jacobite Rising across the ocean and straight through the War of the Regulation into the American Revolution," she said. "At the time of the revolution, one colonist out of every three was from Scotland." Gwyneth Paltrow shares Brad Falchuk wedding photo: "Best day of our lives"